Story: Forced to leave their collapsing house, Rana and Emad, an Iranian couple who happen to be performers rehearsing for Arthur Miller's "Death of a Salesman" rent a new apartment from one of their fellow performers. Unaware of the fact that the previous tenant had been a woman of ill repute having many clients, they settle down. By a nasty turn of events one of the clients pays a visit to the apartment one night while Ranaa is alone at home taking a bath and the aftermath turns the peaceful life of the couple upside down. Winner of this year's Best Foreign Language Oscar, plus Best Actor and Screenplay at Cannes. The director also won the same Oscar in 2012 for "A Separation". 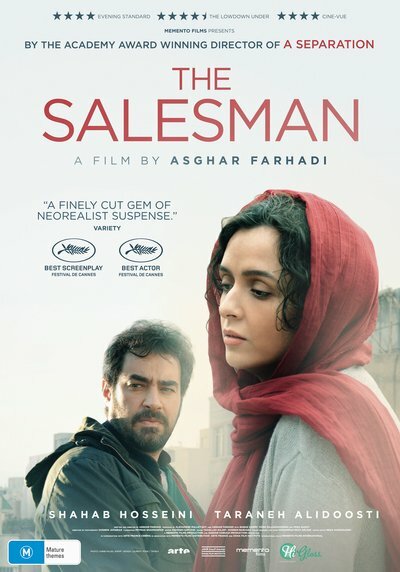 Presented in Persian and English with English subtitles. From Iran.